Style and beauty | Mini-Vows: She Was Stuck in Sand. He Was Promptly Stuck on Her. Mini-Vows: She Was Stuck in Sand. He Was Promptly Stuck on Her. Christina Lynn Boser and Michael James Toblar Choate were married April 13 on Santa Cruz Island, Calif. Brittany Bauhaus, a friend of the couple who became a Universal Life minister, officiated. Ms. Boser, 37, is an island ecologist for the Nature Conservancy, a nonprofit environmental organization based in Arlington, Va. She graduated from the University of Wisconsin, Madison, and received a master’s degree in coyote behavioral ecology from SUNY College of Environmental Science and Forestry in Syracuse. She is the daughter of Sheryl L. Boser of Madison and the late William R. Boser. Mr. Choate, 30, is a subsea business industry specialist for the Department of Defense in Ventura, Calif. He graduated from the Maine Maritime Academy in Castine, Me. He is the son of Deborah T. Choate and Rick J. Choate of Valencia, Calif.
Ms. Boser and Mr. Choate met in April 2016 at Harbor Cove Beach in Ventura when the old work truck Ms. Boser was driving got stuck. She had driven to the beach to collect sand for a restoration project on Santa Cruz Island, where invasive Argentine ants were swarming baby birds in their nests, interfering with native plant pollination and crowding out native ants. To rid the island of these pests without harming other species, she designed specialized bait, and wanted to do a trial run of the distribution equipment, using sand as a stand-in for the bait. All was going as planned, until the truck got stuck. Mr. Choate and a friend were also at the beach watching ships pass along the shore when they heard the sound of tires spinning. Mr. Choate rode his bike over to help. He used a piece of wood as a wedge and was able to steer the truck back onto compacted sand. He rode away, but returned to suggest that he and Ms. Boser exchange numbers, in case, he said, she should ever need his help in the future. Ms. Boser agreed before it dawned on her that this was a flirtation. She had not seen it coming. The next day Mr. Choate called to invite Ms. Boser to go hiking at Arroyo Verde park in Ventura. She in turn asked him to join her and some friends for oysters at the beach. Mr. Choate, impressed with her travel, said, “That’s when I found out she’d been all over the damn world.” Afterward, strolling along the Ventura pier, they kissed. But Mr. Choate left town the following week. As the captain of a ship that supplied oil rigs in the Gulf of Mexico, he was often gone for a month at a time, and home for only a few weeks before shipping out again. This schedule did not allow him much opportunity for a relationship. “I’d been single for quite awhile,” he said. The time apart allowed Ms. Boser the chance to gradually adjust to being with someone, but she wondered if it would work long-term. A scientist even in matters of the heart, Ms. Boser populated a spreadsheet with data about a hypothetical wedding. That same week, a heavy rope crushed Mr. Choate’s hand and he had to have portions of two fingers amputated. Ms. Boser booked a flight for later that day. During his recovery, Mr. Choate decided to work closer to home, so he took the job in Ventura installing equipment on the sea floor for the Navy. 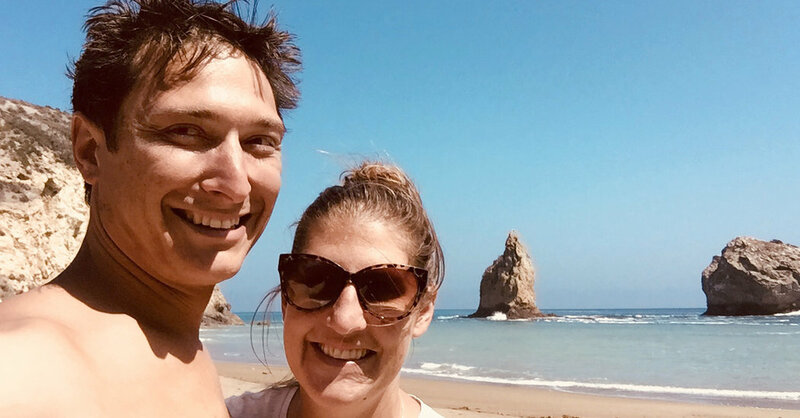 He also flew to Florida to retrieve his great-grandmother’s diamond ring, with which he proposed to Ms. Boser, while kneeling in the crashing surf on the beach at Santa Cruz Island.